The application that handles this deep link is either going to be (1) the one that is being set by the user to handle such URIs, or (2) the only installed app that can handle it, or (3) a list of apps that handle those URIs in case a preferred one was not set by the user in the first place. However, this design has a flaw. Sometimes those deep links contain some sensitive data. If a user is not careful, they might allow a malicious app to handle the deep link instead of the legitimate app. Luckily, there is a solution for this, App Links, which we will describe later. First the user requests to access the service from the app (client). By doing so, the app will handle on behalf of the user (user-agent). The app will direct the Resource Server to the Authorization Server by including to its request the client id, requested scope, local state and a redirection URI to which the Authorization Server will send the user-agent back once access is either granted or denied. The Authorization Server authenticates the user owner via the user-agent and if the operation is successful, the Authorization Server will redirect the user-agent back to the app via the redirection URI containing the Authorization Code. The app will send then this Authorization Code among with some predefined secrets (code verifier as described by PKCE) to the Authorization Server in order to get the Access Token. 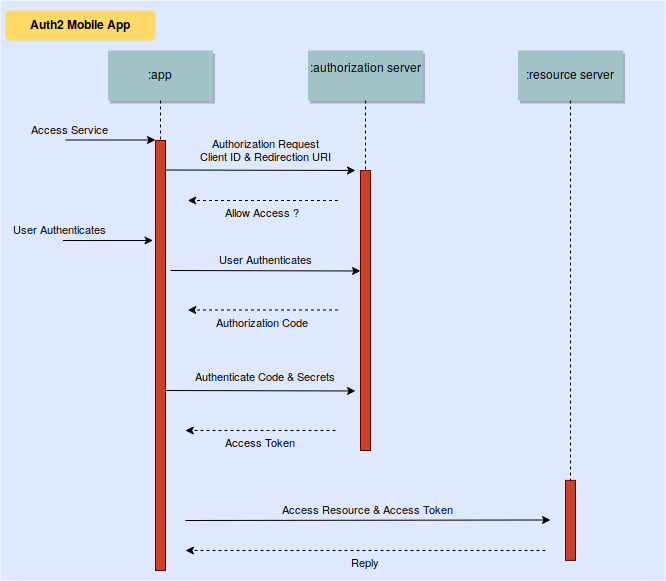 Having obtained the Access Token, the app can request resources from the Resource Server by using usually a REST API with the access token inside the HTTP(S) Authorization Header. Translating the above now to Android terms, in order for the app to be able to receive the Authorization Code from the Authorization Server, it will have to be able to handle the redirection URI that was specified in the initial request. As we described above, this URI will contain the Authorization Code. As you might have already guessed, to do that on Android you have to use either the insecure version of deep links or the more secure one App Links. By using the former, a malicious installed app might be able to obtain the Authorization Code and if it has access to the secrets it might be able to obtain the Access Token as well. Putting it all together we will show how this flaw of deep links can lead to a malicious installed mobile app to obtain access tokens. The mobile app is called FastHub for GitHub and its SHA-256 is: c732c21ebacd3e8f0413edd770c11b280bc6989fe76ba825534fd3cdc995d657. NowSecure disclosed this vulnerability to the developer and he acknowledged the issue. What we see here is that if we authorize the app to access our GitHub account, the redirection URI will be fasthub://login. To verify that this is a deep link, we can use apktool to obtain the AndroidManifest.xml in case we had only the APK file. There we find the activity com.fastaccess.LoginActivity with the following deep link that matches the one that we saw above. Now it is time to see how GitHub authorizes OAuth apps. First the app has to make a GET request to https://github.com/login/oauth/authorize including the client_id, redirect_uri and login among the parameters. If the user now accepts that request, GitHub redirects back to the app with a temporary code, the authorization code. After the app receives that, it makes a POST request to https://github.com/login/oauth/access_token with client_id, redirect_uri, client_secret and redirect_uri among the parameters in order to obtain the access_token. Having the access_token, the app can access the GitHub API on behalf of the user. So if we could obtain the client_id and client_secret we might be able to create a malicious app that grabs the access_token before the legitimate app gets it. Let’s use radare2 to see if the app contains the client_id and client_secret hardcoded. We unzip the app and we open classes.dex with r2. We list the classes/methods and we see if any of those contain the keyword “secret”. The last one seems pretty interesting. Let’s find out what methods the GithubConfigHelper class has. Having found the client_id and client_secret we can create the following activity in our malicious app. Upon authorizing the legit app to access our GitHub profile, our app is going to display the access_token, with the assumption of course that our app is the default one (or is being selected by the user) to handle the fasthub://login deep link. Having a secret value hardcoded inside a mobile app binary file is always not a good decision, especially when this value is not obfuscated at all. A good security practice is to have those secret values communicated to the app by a remote backend server over a secure transmission protocol. The package name should match your app’s package name and the sha256_cert_fingerprints should match the ones of your app’s signing certificate. Whenever a user clicks an app link, Android will contact your web server, grab the assetlinks.json file and verify that the package name and the app’s signing certificate hash value matches the one of your app. As long as the web server is not compromised, only a single legitimate app will be able to handle this App Link. For more details please read here. To reduce risk in the mobile apps your team develops, we recommend incorporating automated mobile application security testing into the dev pipeline to find and fix security and privacy flaws faster. NowSecure offers cloud-based and on-premises dynamic application security testing tools and professional services. Get a demo today. At NowSecure Ioannis spends his days researching mobile security threats with a focus on the Android operating system. Ioannis holds a Ph.D. in Computer Science and a Bachelor of Science in Informatics. Publications Ioannis has contributed to include Detecting Android Root Exploits by Learning from Root Providers, Programming Flows in Dense Mobile Environments: A Multi-user Diversity Perspective, Resource Thrifty Secure Mobile Video Transfers on Open WiFi Networks, and Efficient Real-time Information Delivery in Future Internet Publish-Subscribe Networks.